ZIMBABWE – The $1.5 billion is planned for a short term humanitarian assistance and it will also respond to long term climate changes in Zimbabwe. Authorities in the country have said that there’s an urgent need to import at least 1.4 million tonnes of grain from neighboring countries at a cost of nearly $720 million dollars after drought slashed harvests, leaving 3 million of people in need of food aid. Last week, Zimbabwe’s Vice President Emmerson Mnangagwa appealed to international donors, private sector and the people of Zimbabwe, including those in the diaspora to give money in support of emergency relief efforts. Zimbabwe has been hard hit by severe drought which wiped out over 70 percent of its crops in the southern part of the country. 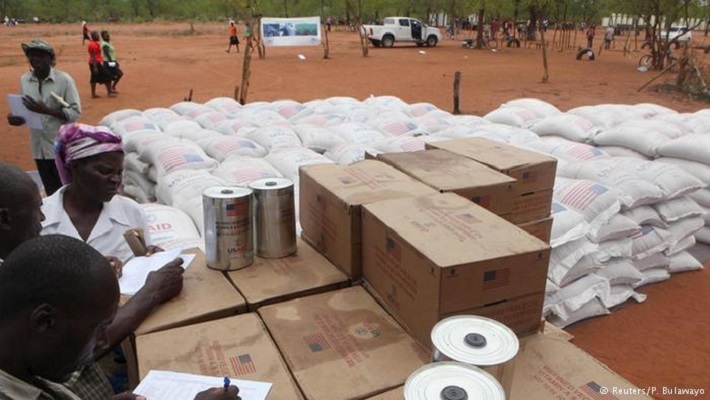 The acting director for United States Agency for International Development (USAID) in Zimbabwe, Suzanne Truchard said the situation remains dire. “Many households who are relying on South African currency [Rand] for food and remittances are facing difficulties in accessing food on the market,” Truchard said. The southern African country stopped using its own currency in 2009 after hyperinflation, which had peaked at around 500 billion percent, rendered it unusable. It then started using a slew of foreign currencies, including the US dollar and the South African rand. Meanwhile, the Zambia government has banned export of maize grain to Zimbabwe, leaving Zimbabwean millers struggling to get about 70 000 tonnes of already paid from their northern neighbors, the state-owned Herald, newspaper reported on Monday. Zambia imposed an export ban as the country also tries to boost its reserves in the wake of an El Nino induced drought, the report said. Zimbabwean importers were getting grain from private farmers in Zambia after the government has relaxed import regulations to allow individuals and private companies to import grain to supplement local supplies. So far, Zimbabwe imports consist of maize grain from Zambia and maize meal from South Africa, according to the agriculture ministry. President Robert Mugabe has in past warned western governments not to meddle into his country’s internal politics and its management. Consequently, Mugabe came up with land redistribution programme in 2000 that evicted white farmers and now the country is relying on neighbors for grain because of low yields. The head of European Union (EU) mission in Zimbabwe, Philippe Van Damme, has criticized Zimbabwean authorities for failure to distinguish the short term humanitarian assistance and long term response. By making a distinction between two, according to Van Damme, it will help donors to know how much money they needed to raise urgently. “The 1.4 million metric tonnes of cereals which have to be imported is a total consumption of the country,” Van Damme said. In addition to the EU, other aid agencies have also asked the government to provide specific information about the scale of humanitarian assistance that they need. For now, the United Nations Development Programme(UNDP) has raised $ 60 million for food aid in Zimbabwe and is feeding one million people as the country faces its worst drought in a quarter century, the agency’s local head said last week. The UNDP head of mission in Zimbabwe, Bishow Parajuli, said the UN plans to raise $130 million under an emergency fund. Now, more than a quarter of population in Zimbabwe is hungry and at least there has been over 16 000 cattle deaths in the last few months. As DW’s Privilege Musvanhiri reports, the situation in Masvingo province, some 400 kilometers away from Zimbabwe’s capital-Harare is even worse. The province is located in a region of Zimbabwe where rainfall is minimal and uncertain. This has been worsened by the El Nino weather phenomenon that is affecting the entire Southern Africa region. One elderly couple from Madzivadondo in Chivi, 92-year-old Elijah and his blind wife Egneta Zvidzai painted a grim picture of their situation. “We received a little rain a long time ago, but not even a single drop in recently. We are just waiting and desperate,” Zvidzai told DW. The suffering is likely to worsen if the Zimbabwean government does not quickly address the issues raised by the donors. Other aid agencies have even suggested diverting assistance to the horn of Africa where millions people are also facing severe hunger following drought caused by the El Nino weather patterns. As many as 49 million people in southern Africa could be affected by a drought that has been worsened by the most severe and longest El Nino weather pattern in 35 years, the United Nations World Food Programme (WFP) said on Monday(15.02.2016). El Nino events typically bring drier conditions to southern Africa and wetter ones to East Africa. The dry, hot conditions are expected to persist until the start of the southern hemisphere autumn in April or May. Privilege Musvanhiri and Columbus Mavhunga contributed to this report.